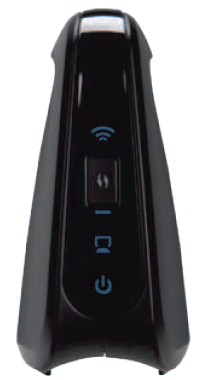 The Wireless-N Access Point with Dual-Band (WAP610N) adds wireless capability to your existing wired network, or upgrades older wireless networks to Wireless-N performance. The Wireless LED lights up blue when there is a wireless connection. The LED flashes when the access point is actively sending or receiving data over the wireless network. The LED flashes blue/amber for two (2) minutes during the Wi-Fi Protected Setup™ process. It lights up blue when wireless security is enabled. If there is an error during the WPS process, the LED lights up amber. The Ethernet LED lights up blue when there is a wired connection. The LED flashes when the access point is actively sending or receiving data over the Ethernet port. The Power LED lights up blue when the access point is powered ON. The Ethernet port connects the access point to a router. Press and hold the Reset button for approximately five (5) seconds to reset the access point to factory defaults. The Power port connects the access point to the included power adapter. QUICK TIP: The WAP610N only supports Wired Equivalent Privacy (WEP) with hexadecimal format security key. If your gateway is setup with a WEP ASC II format, contact your Internet Service Provider (ISP) for assistance.